(Cambridge, Mass. — April 24, 2009) WMBR disc jockey Jon Bernhardt will celebrate his 25th anniversary with the morning Breakfast of Champions radio program on Friday, June 26, from 8 – 10 a.m. To mark this auspicious occasion, he has convinced the bands that have been played the most on his program to perform at a pair of benefit concerts at two Boston area clubs. UK legend Bevis Frond will play in his only U.S. appearance on Sunday, June 21 at TT the Bear’s along with the Condo Fucks and Sleepyhead. Versus reunites to play Church with Rebecca Gates (The Spinanes) and more guests TBA, on Saturday, June 27. Proceeds will benefit WMBR. Tickets for both shows are on sale now. On his June 26, 2009 anniversary program, Bernhardt plans to count down the 33 songs he’s played the most over his 25 year career. With the painstaking meticulousness of an actuary (see below), Bernhardt spent 18 months typing all 25 years worth ofÂ playlists into a database, so that he could figure out which bands and songs he played the most. Many of those bands will be heard on the June 26 program, and some will probably be as much of a surprise to listeners as they were to Bernhardt himself. Bernhardt began volunteering at the M.I.T. community radio station in September, 1983. His first Breakfast of Champions program was broadcast on Thursday, June 28, 1984, but by the fall of 1986, he had settled into the Friday morning slot of the indie-rock institution, where he remains today. He was named “Best College DJ” by The Boston Phoenix. Throughout his tenure on the Breakfast of Champions, he has been an early champion of many bands that later achieved a modicum of fame and success. During the day, Bernhardt works as an actuary for a major metropolitan insurance company. He’s held various jobs there since graduating college. When he’s not being an actuary or a disc jockey, he can often be found playing theremin, both in the Lothars and as a solo artist. No promises, but if asked nicely, he may do a few numbers at these shows. He lives in Somerville. WMBR is the MIT campus radio station, broadcast on 88.1 FM between 20 and 24 hours per day, 365 days a year. 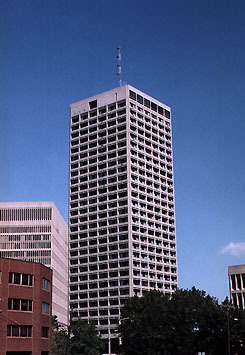 The station transmits at 720 watts, effective radiated power from the top of the Eastgate Building in Kendall Square in Cambridge, Mass. Programming includes a wide range of music shows, public affairs programs and eclectic audio entertainment. Playlists for all of Jon Bernhardt’s radio shows, as well as a select number of other WMBR jocks, can be found at http://www.track-blaster.com/wmbr. WMBR broadcasts at 88.1 FM in Cambridge Massachusetts, and on the Internet at http://wmbr.org. This entry was posted in Jonnie Spaceman, Music, WMBR by Jon B.. Bookmark the permalink.